I travelled to Namibia, the meerkats’ natural habitat in the wild, but there was not enough time to create the book while I was there. When I returned to Sydney, I went to Mogo Zoo and Taronga Zoo to watch the meerkats. I spent hundreds of hours at both zoos taking photographs and writing about their behaviour. They behaved naturally in the zoo environment, so I was confident the book is a true to life record of their daily lives. Meerkats are so entertaining. I love watching the family members helping each other and looking after the babies. The lookout guide is always vigilant even in a zoo environment. 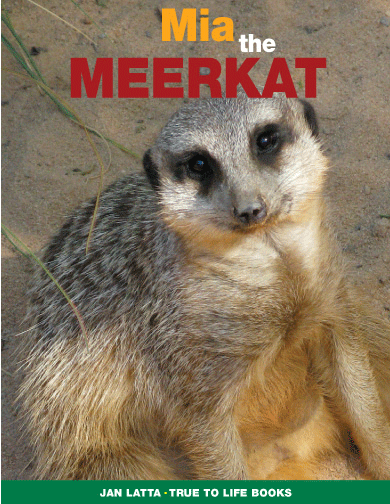 The concept for the book is the meerkat talking to children about its life in the wild and how it can survive. There are maps, interesting facts and fun activities. See this video of meerkats in the wild.